HOOQ – the largest Video on Demand service in South-East Asia – premieres 5 original selected screenplays as pilot episodes to on the platform today. This is part of the inaugural HOOQ Filmmakers Guild wherein the best of these 5 pilots will be commissioned into a full series on the platform. The 5 pilots are: Bhak (India), Haunt Me (Singapore), How To Be A Good Girl (Singapore), Aliansi (Indonesia) and Heaven and Hell (Indonesia). 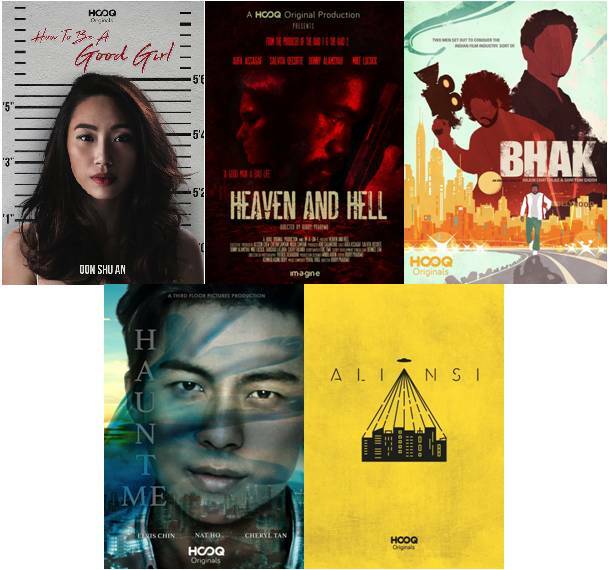 The 5 were selected from over 500 submissions received by HOOQ, over a 2-month period, from all over South East Asia.They comprise a mix of genres, from sci-fi comedy to action-thriller and even supernatural-horror. Launched in June 2017, the HOOQ Filmmakers Guild is an annual initiative designed to seek out film talents in Asia that have great ideas but lack the opportunity to bring them to life on screen.Each of the above 6 screenplays received USD 30,000 to produce the pilot episode. The pilots will now undergo judging from 5 esteemed filmmakers from Asia, namely Indonesia’s Mouly Surya and Nicholas Saputra, Philippines’ Erik Matti, as well as Thailand’s Wasin Pokpong, and Puttipong Promasakha Na Sakolnakorn. In addition to professional judging, viewership numbers will also be taken into consideration and will also be factored in before the winner is selected. Award-winning Filipino filmmaker and competition judge, Erik Matti, commented, “Coming in, I had high expectations for this initiative knowing that there is a vast landscape of untapped talent across Asia. True enough, my expectations were met by the sheer amount of fresh and unique talent that stepped up to the plate. And now, I can't wait for these chosen filmmakers to finally be able to showcase their work. Regardless of who wins, I have no doubt that these pilots will not disappoint”. It’s easy to get HOOQ’d. Customers can simply download the HOOQ app from Apple Store or Google Play, sign up or log in, to access HOOQ’s library of top Hollywood and Asian hits anytime, anywhere and on any device including computers, smartphones, tablets, set-top boxes, and smart TVs via Google Chromecast and all Apple devices. Globe customers can get to try HOOQ for up to 60 days on selected mobile and broadband plans. Find out more and sign up today for a complimentary trial at www.hooq.tv.